Late in March, I ease my way down to the talus slope in an attempt to escape female ticks eager for blood to nourish their eggs. I’ve never been surefooted, so, clutching my walking stick, I only go far enough out on the rocks to escape the bloodsuckers. Luckily, the March wind is blowing, which blocks much of the noise from Interstate 99 below and the factories and trains beyond. 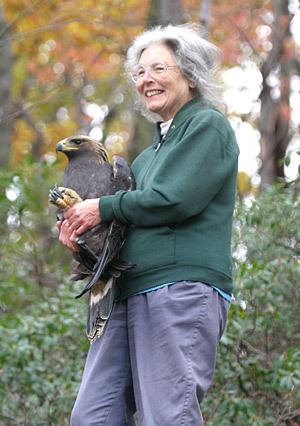 It also gives gliding power to the turkey vultures and other raptors heading northeast. Unfortunately, the talus slope, facing north, overlooks the partially industrialized Logan Valley and not the bucolic Sinking Valley on the south side of the mountain. It also provides a view of the emerging industrial wind farm on the Allegheny Front, a location bound to slice and dice the golden eagles, songbirds, and bats that migrate down the Front in the fall. Instead of looking outward at such a view, I study the close-up world of the talus slope. The pink and silver boulders, each not only made unique by its shape and color, but by patterns of multiple lichen and moss species. Composed of blocks of Silurian Tuscarora quartzite, these rocks were probably broken apart in the Pleistocene Epoch during the four glacial periods that came from the Laurentide ice sheet, centered in Hudson Bay. Two lobes of the ice sheet, near its southern margins — the Erie Lobe in northwestern Pennsylvania and the Lake Champlain/Hudson River lobe in northeastern Pennsylvania — glaciated those areas of the state but left much of Pennsylvania unglaciated, including our south central Blair County. But we had a tundra climate and permafrost that produced perfect conditions for periglacial activity. According to The Geology of Pennsylvania, edited by Charles H. Shultz, the glaciations caused “extensive mass wasting throughout the nonglaciated part of Pennsylvania through extensive rock breakup and downslope movement of broken material. The hard sandstone on top of the ridges [such as our Tuscarora sandstone] has numerous plates of bedding and fracture and thus is very susceptible to break up by freeze-thaw cycles.” That broken rock becomes talus. A mere ten thousand years ago, we entered the interglacial Holocene Epoch. 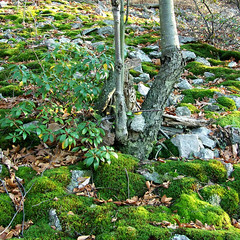 Since then lichens, mosses, even pockets of trees and shrubs, have slowly changed the face of our talus slope. The lichens begin the process, penetrating the stone with their filamentous hyphae. Called “nature’s pioneers” because they can live on bare rock, the tissues of crustose (crust-like), foliose (leaf-like), and fruticose (shrubby or hair-like) lichens, along with certain mosses, continually die and add decayed material to rock minerals. The lichens also capture dust and silt that blows over them, eventually forming pockets of soil. In those pockets, the seeds of hardy vascular plants and spores of mosses develop. The usual pattern of rock soil development in eastern North America begins with colonization by the crustose, foliose, and fruticose lichen species, all of which I can find on our talus slope rocks, as well as with mosses in the Andreaea and Grimmia genera. 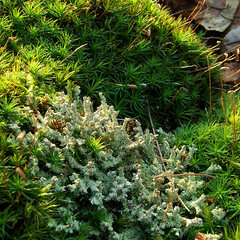 They are followed by Cladonia (British soldiers lichens), as well as grasses, herbs, and hairy-cap moss. In fact, I am sitting on a soft bed of hairy-cap moss that covers the rock like a lush rug. Close by I see British soldiers lichens and other moss species. On nearby bare rocks, I pluck three different foliose lichens that are attached by a central, stout peg and are called “umbilicate” — species of rock tripes and jelly lichens. I also note several crustose lichens that form mostly black crusts on the rocks. These lichens are self-sufficient, taking the few minerals they need from dust and supplying their own carbohydrates through their sugar-producing photobionts (the photosynthetic part of lichen, which is either green algae or cyanobacteria, formerly known as blue-green algae). 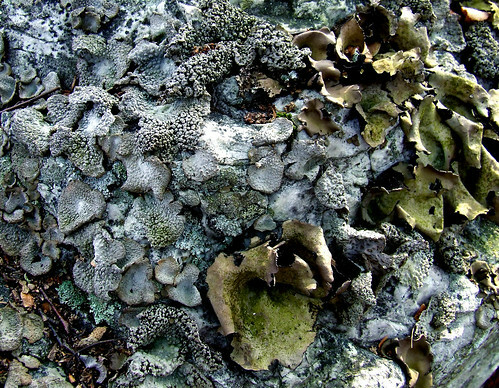 If their photobiont is cyanobacteria, these pioneering lichens are nitrogen-fixing factories that enable the lichens to establish themselves on nitrogen-poor rock surfaces. Their propagules (reproductive parts) are incredibly tiny and can grow on even the smoothest surface. Moss spores are also tiny and bryologists (people who study mosses) had previously believed that moss sperm needed a continuous film of water from rain, dew, or waterfall spray to swim to moss eggs and produce spores. But Swedish researchers were not so sure because too many moss fertilizations were difficult to explain. They suspected that as with plant pollination, invertebrates might be involved. And they were right. A series of recent experiments they conducted proved that mites and springtails, which are known to inhabit moss, carry sperm between plants. Not only that, but the invertebrates actually choose fertile moss shoots and ignore sterile ones, probably because the fertile shoots are rich in sugar and fat. Like honeybees, they are rewarded for their labor. This new finding may explain how mosses reproduce on dry rocks such as on our talus slope. 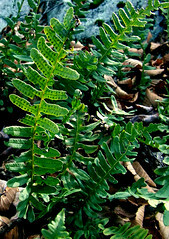 Growing in the rock crevices are evergreen common polypody ferns. They, too, are rock-loving plants known also as “rock polypody” and “rock cap fern.” Their long-creeping rhizomes allow them to move into an area and form thick mats. From where I sit, I can see at least one “island” of shrubs and trees on the talus slope. A clump of paper or white birches grows above the mountain laurel. White pine and pitch pine also find purchase among the rocks. Many twisted black birches thrive on tongues of earth that snake down through the talus. And that is as much as I can see from my perch. But our three sons have been fearless explorers of the rocks since we moved here back in 1971. Of course, I told them to keep off the rocks because; having just moved down from Maine where there are no poisonous snakes, I was afraid such bare rocks would harbor them. 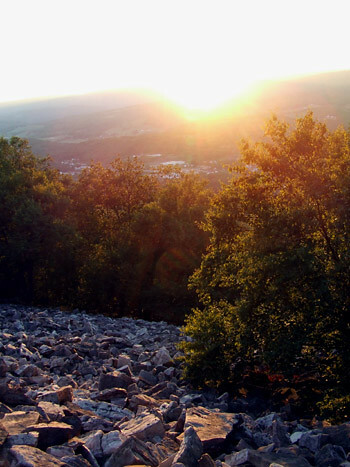 During my year as a Girl Scout camp counselor south of Harrisburg, I clearly remembered climbing up a rocky mountaintop and hearing the hiss of snakes on the rocks above me. I knew that Pennsylvania was the home of both rattlesnakes and copperheads. Of course, my sons ignored my warnings. Soon they were climbing all over the rocks in bare feet and assuring me there were no rattlesnakes or copperheads living in them. They never did see or hear any snake species on the talus slope. Our eldest son, Steve, spent autumn days, when the wind was out of the northwest, sitting in the middle of the talus slope behind a barrier of boulders erected by hunters, watching the raptor migration. Instead of staying above Bald Eagle Mountain as they head south, after the raptors cross the Tyrone gap, they dip down behind the mountain (what we call Sapsucker Ridge) and sail past the talus slope, popping above the ridge only at the top of First Field where I get a quick look at them from Alan’s Bench before they rise high above the mountain and continue their journey. Our youngest son, Mark, who conducted an in-depth study of the plants on our property back in the summer of 1987 as part of what he called Bioplum: A Natural Inventory, included the plants on the talus slope which we have always called the rock slide. After much searching, he found a single American mountain-ash on the rock slide. A northern species, it grows either along cold swamps or bogs or on rocky mountain ridges. Known for its clusters of brilliant orange-red fruits in the fall beloved by robins and other fruit-loving birds, it often associates with rock-loving yellow birches. Indeed, Mark recorded yellow birches commonly straddling rocks on the rock slide. The paper or canoe birches I can see from my seat are another northern species that grows mostly in northeastern and north central Pennsylvania but is fairly common on our talus slope. Big-tooth aspen, usually an early successional forest species, appears sparsely on the talus slope. Fire cherry, another early successional tree with birch-like bark and cherry-like leaves, grows more abundantly among the rocks. Large-leaf holly, a deciduous, large, multi-stemmed shrub or small tree, forms large clumps on the rock slide. And, Mark writes, “Laurel thickets are most impenetrable in the rockslide forest of Sapsucker Ridge.” On the ground beneath them is abundant teaberry. As far as wildlife is concerned, extensive searching of the talus slope has turned up no sign of eastern woodrats even though my husband Bruce and son Steve once saw one near our big pull off on our hollow road one night. I’ve tracked porcupines, foxes, and bobcats to the talus slope and suspect they find refuge and maybe dens among the boulders. 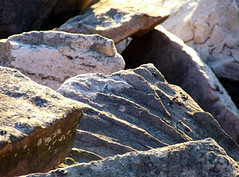 I have seen gray squirrels moving easily over the rocks. 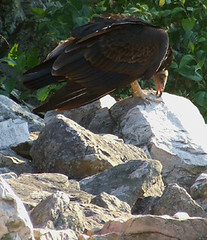 Our son, Dave, has photographed immature turkey vultures standing like sentinels on the rocks, but we have not found any evidence of nesting within the larger boulders. Still, as I finish my long sit in the moss bed, I watch turkey vultures gliding past, back from wherever they spent the winter, perhaps looking for likely nesting areas. No doubt, they are ready, as I am, for another Appalachian spring. All photos by Dave Bonta. Click through to Flickr to see larger versions.